The Ministry of Care is one of the oldest ministries in Christianity. As Christians we are called by Jesus to serve those in need: the hungry, homeless, vulnerable and sick, and his words from Matthew 25:36 are at the heart of the Ministry of Care mission. We believe that Serving Beyond the Church Walls our ministry can be a sign of the support, love and concern that our Church has for the sick, the elderly, the homebound, and those experiencing a time of need. 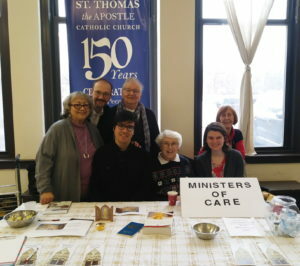 Who we are: We are a parish members called to minister God’s people in extraordinary circumstances: to bring the Holy Eucharist, prayer, and compassion to members of the community who are unable to attend Mass: to Catholic patients at the University of Chicago Hospitals, to local nursing homes and Assistant Living, and to homebound. The sacramental ministry of prayer and Holy Communion is central to the work of Ministers of Care, but this ministry always involves being present to help out in some way, even if only to give the gift of listening and companionship. Time commitment: Our volunteer work can fit into your own personal schedule. Most volunteers give two or three hours a week at a time convenient to both the minister and the patient or homebound people. Training and mentorship is provided by experienced Ministers of Care. If you believe this is your call, please join us!